Electronic infant protection systems have, to date, been department-level solutions. A new generation of Wi-Fi technology, however, expands infant protection hospital-wide, presenting new opportunities. 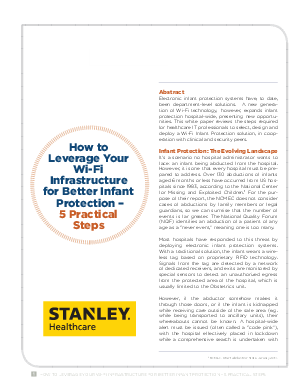 This white paper reviews the steps required for healthcare IT professionals to select, design and deploy a Wi-Fi Infant Protection solution, in cooperation with clinical and security peers.